Nokia 6 Basics Settings - Here is the Nokia 6 manual that guide you to know details of the Nokia 6 and basic setup to advantage fot the best Nokia 6 settings. 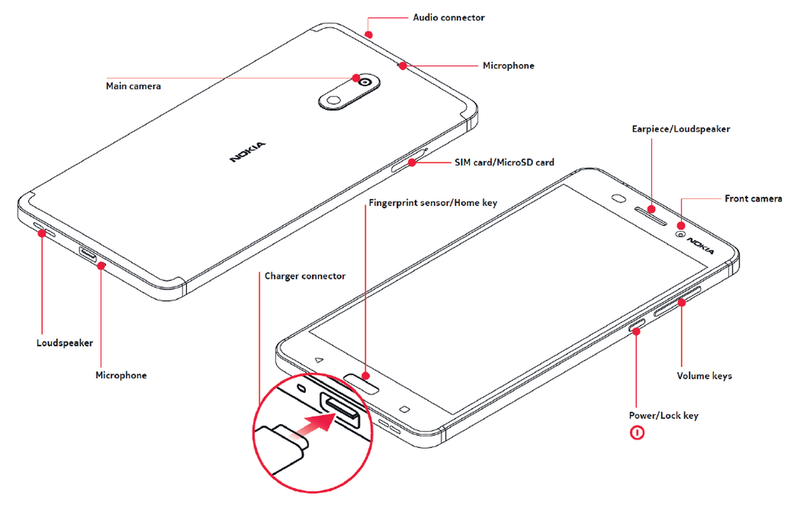 For your safety, Read these simple Nokia 6 guidelines. When a carry case, belt clip or other form of device holder is used for body-worn operation, it should not contain metal and should provide at least the above-stated separation distance from the body. Note that mobile devices may be transmitting even if you are not making a voice call. Not following them may be dangerous or against local laws and regulations. 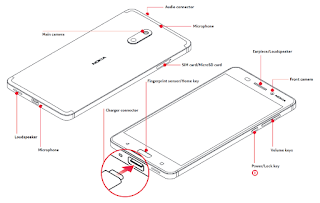 Switch the Nokia 6 smartphone off when mobile phone use is not allowed or when it may cause interference or danger, for example, in aircraft, in hospitals or near medical equipment, fuel, chemicals, or blasting areas. Obey all instructions in restricted areas. Use only batteries, chargers, and other accessories approved by HMD Global for use with this device. Do not connect incompatible products. Your Nokia 6 device is not water-resistant. Keep it dry. The device screen is made of glass. This glass can break if the device is dropped on a hard surface or receives a substantial impact. If the glass breaks, do not touch the glass parts of the device or attempt to remove the broken glass from the device. Stop using the device until the glass is replaced by qualified service personnel. SAR values can be found in the SAR section of this product’s Get started guide. Do not connect to products that create an output signal, as this may damage the device. Do not connect any voltage source to the audio connector. If you connect an external device or headset, other than those approved for use with this device, to the audio connector, pay special attention to volume levels. Parts of the device are magnetic. Metallic materials may be attracted to the device. Do not place credit cards or other magnetic storage media near the device, because info stored on them may be erased. Charge the Nokia 6 battery and switch your phone on. Plug a compatible charger into a wall outlet, and connect the cable to your phone. Your phone supports the USB micro-B cable. You can also charge your phone from a computer with a USB cable, but it may take a longer time. If the battery is completely discharged, it may take several minutes before the charging indicator is displayed. User manual to switch your phone on, press and hold the power key until the phone vibrates. The phone guides you through the setup. Make the most out of your phone’s features from the get-go. When you switch your phone on for the first time, your phone guides you to set up your network connections and phone settings. Follow the instructions shown on your phone. You can unlock your phone with just a touch of your finger. Set up Nokia 6 fingerprint ID for extra security. If you want to avoid accidentally making a call when your phone is in your pocket or bag, you can lock your keys and screen. You can also set the keys and screen to lock automatically. Press the power key, and swipe up across the screen, or use the fingerprint sensor. If asked, provide additional credentials. Avoid contacting the touchscreen with other electrical devices, using excessive pressure, or tapping it with sharp objects. It’s best to use your fingers or dedicated accessories. Leaving the touchscreen on for a long time may result in afterimages (screen burn-in) or ghosting. Lock your screen when you’re not using the phone to avoid that. Explore Nokia 6 with a tap, swipe, or drag. Avoid scratching the touch screen. Never use an actual pen, pencil, or other sharp object on the touch screen. To open an app or other item, tap the app or item. Slide your finger quickly in a flicking motion up or down the screen, and lift your finger. To stop the scrolling, tap the screen. Place 2 fingers on an item, such as a map, photo, or web page, and slide your fingers apart or together. The screen rotates automatically when you turn the phone 90 degrees. To lock the screen in its current orientation, swipe down from the top of the screen, and tap Auto-rotate to switch to Portrait. To see which apps you have open, press the square key. To switch to another app, tap the app you want. To close an app, tap X. To go back to the previous screen you were in, tap the back key. Your phone remembers all the apps and websites you've visited since the last time your screen was locked. To go to the Home screen, tap the Home key. The app you were in stays open in the background. Learn how to get the most out of your Nokia 6 first time settings. 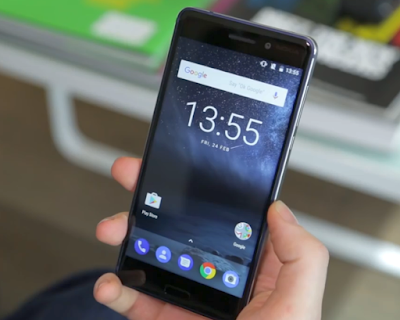 Personalize your Nokia 6 and learn how to personalise the Home screen, and how to change ringtones. Tap Settings > Display > wallpaper. Tap Settings > Sound > Phone ringtone. Tap Settings > Sound > Message notification. Each Nokia 6 SIM has its own ringtone you can change. On the Home screen, select an app icon to open it. To open one of the apps running in the background, tap the square key, and select the app. Tap the square key, and tap X on the app you want to close. Tap the square key, swipe up through all apps, and tap CLEAR ALL. Stay in touch with what’s happening on your phone with notifications. When you receive new notifications, such as messages or missed calls, indicator icons appear on the status bar. To see more information about the icons, open the notification panel and view the details. To open the notification panel, drag the status bar downwards. If you have problems hearing your Nokia 6 ringing in noisy environments, or calls are too loud, you can change the volume to your liking by using the volume keys on the side of your phone. Do not connect any voltage source to the audio connector. If you connect an external device or headset, other than those approved for use with this device, to the audio connector, pay special attention to volume levels. Nokia 6 tutorial how to take screenshot below and you can view captured images in Gallery. Press and hold the Power key and the Volume down simultaneously.